The change to fall colors has finally started. We have been watching the trees around Killington to determine when the fall leaf peeping season might begin. Usually by this calendar date fall colors in the mountains are starting to emerge through the summer greenery of the mountains. But with climate change taking place (and while I hate the political paint brush people put on that term, it is really happening folks), the seasonal boundary between summer and fall is definitely moving. But it looks like things are finally starting to change. The colder, darker, weather of the early part of last week set up a trigger condition to tell the trees in the area to begin shedding there summer finery. Last week there was a six day stretch where sunlight was muted by copious high cloud cover and full blown overcast. Evening temperatures were down into the 40's with upper elevations nearing the high 30's. While this impact was not instantaneous, driving around town today clearly revealed that the change has in fact started to take place. It is still way too early to make any predictions on the progress that the trees will make as they shed the chlorophyl in their leaves. Over the last several days we have seen mostly sunny conditions with warm and humid nights. This may slow down the process, or it may not, depending upon what happens over the next couple of days. Suffice to say the ouija board will stay in the closet for another week or so before we make any predictions. it is all part of the fun of the fall season. Wherever you may be, hopefully you are staying dry, and can enjoy the changing seasons. With an absolutely beautiful weather weekend on tap for the Green Mountains of Vermont, we welcome all of our guests who are visiting the area to participate in the Vermont Beast Race, the Vermont Ultra, and the Vermont Sprint as part of Spartan Weekend. 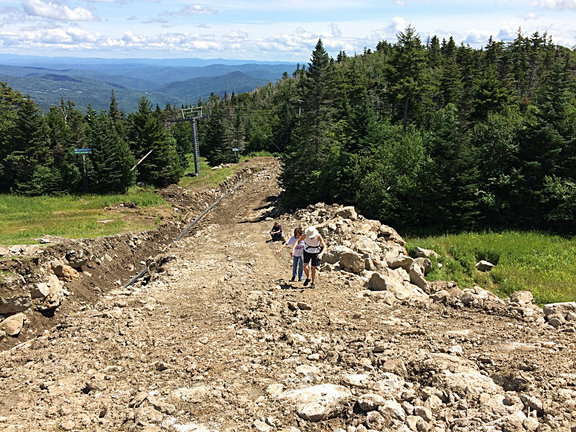 Each year thousands of people descend upon Killington to test their physical and mental endurance on a challenging obstacle course spread out over the 6 peaks of the Killington Resort. From the start at the Snow Shed Base Lodge, many participants will face a vertical climb from 2000 feet to Killingtons 4241 peak while crossing many obstacles ranging from barbed wire, to ponds, to fire pits along the way. Everyone is challenged, many complete the course, but all usually leave with the satisfaction that they have stood up to "the beast". 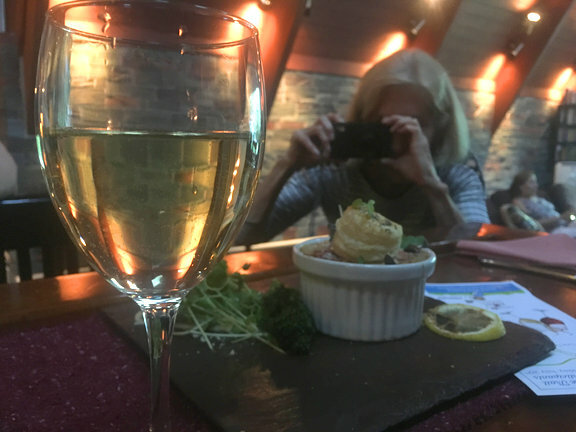 At the inn this weekend, we have our normal dinner service starting Friday and Saturday nights at 6:00 PM. We have added several pasta dishes to our menu for those who want to "carb up" on Friday, or replenish their energy stores on Saturday. In addition to the restaurant, we will also be serving dinner in the bar in the Great Room. Reservations are recommended this weekend for the restaurant due to the large number of people in the area (very similar to a winter weekend.) For reservations, please call the inn at 800.435.8566 or 802.422.4293. Dinner at the bar is of course first come-first served. On a somber note, while many will be experiencing the outdoors this weekend in Killington from a positive point of view, our thoughts are with the people in the mid-Atlantic and southern states as they battle with the problems created by hurricane Florence. Vermont went through that special kind of liquid hell with hurricane Irene. We hope people are staying safe and that the recovery from the storm proceeds quickly and humanely in the coming weeks. Wherever you may be, stay safe and hold your loved ones tight. Thank you Grace and Sal! Over 20 years we have met some very nice people who have gone from guests to friends. 2 very special people are Grace and Sal from Auburn. Every year Grace knits us new slippers to keep our feet warm as the seasons change. Unfortunately the drive to Vermont for them has become harder over the years. But even though they could not visit with us this September, the slippers arrived right on que to coincide with the arrival of cold weather on Saturday night. Two very special people who are dear to us.... Thank you Grace and Sal! Wherever you may be, keep warm as the seasons change in Vermont. The Killington Resort from Superstar thru Snowdon, Monday September 3, 2018. We hope you are enjoying a beautiful Labor Day. And wherever you may be, where it is still summer in the northern hemisphere, don't forget your sun screen. Summer flies by in Killington. Hmm... that was a quick summer! As we continue our journey through life, it is amazing how time just flies bye. Living in the bubble we call Killington does shelter us from some of the chaos of the outside world. But at the same time, if it were not for taking pictures all the time, one would wonder where does all the time go. Overall, it has been a good summer at Killington. The weather, as anyone who lives on the east coast of the United States knows, has had it's ups and downs. During this summer we have had many days with uncharacteristicly large amounts of rainfall, hot temperatures, and high humidity. But when we compare our 80 degree days to the weather some of our guests from the metro areas along I-95 have experienced, the weather and temperatures in Killington have been good. Overall, a very nice summer in Killington. We started the summer with our usual family visit to Massachusetts. 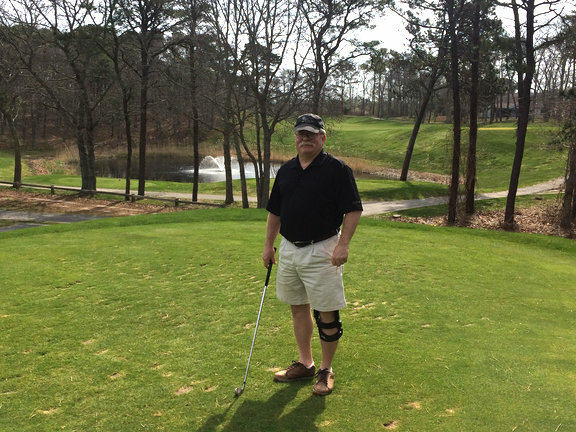 In the middle of it, we took some time for a couple of rounds of golf on Cape Cod. 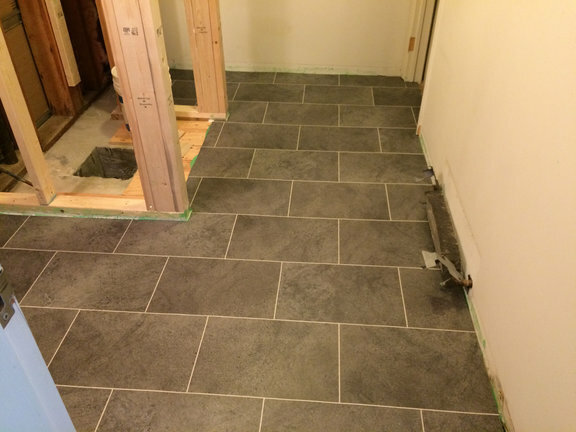 After vacation, we started renovating the bathroom in the Owners Quarters. Here is a look at the new floor Bill put down. The restaurant re-opened for the summer season in late June. We bought new square plates for the chef so he could properly present his handi-work. 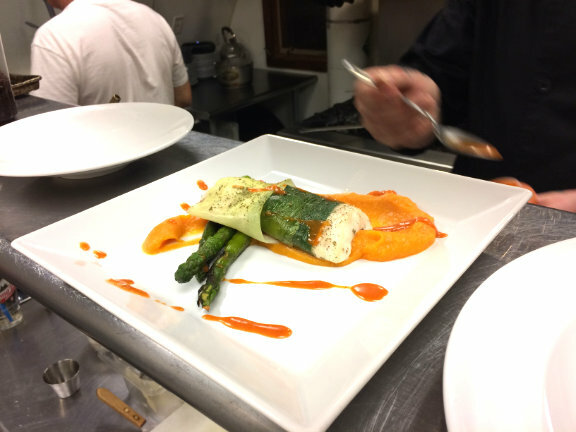 Here is a leek-wrapped poached halibut with sweet potato mash. 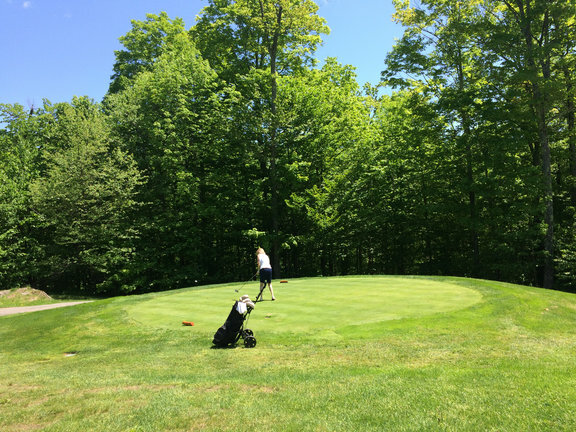 We have enjoyed more than a few nice rounds of golf in Killington. We have had a couple of rounds with Chef Colin this summer. 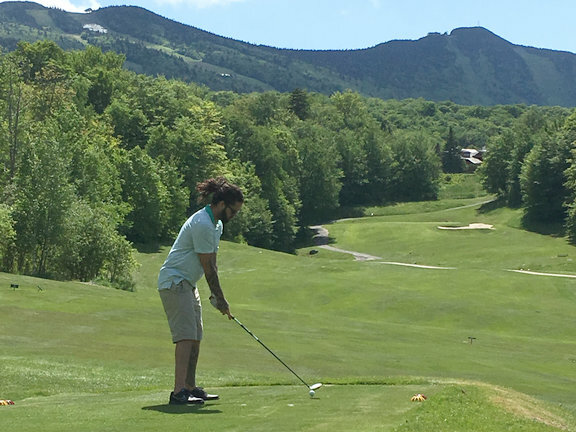 Here is chef teeing off on the 16th hole of the Killington Resort Golf Course. Chef has been hard at work all summer. 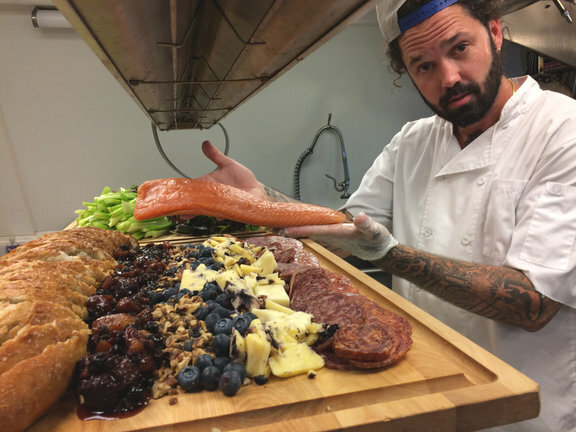 Here he is showing some house cured salmon which he is about to incorporate onto a serving tray for a party at the inn. We have hosted a lot of visitors. 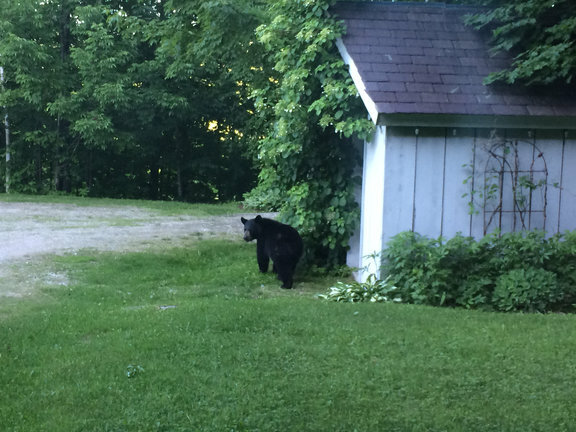 The K-Town black bear has been a frequent guest this summer. We have done a few hikes this year to get the legs in shape for ski season. Mary took me up Deers leap. It was only right that I took her picture as we hiked back down. 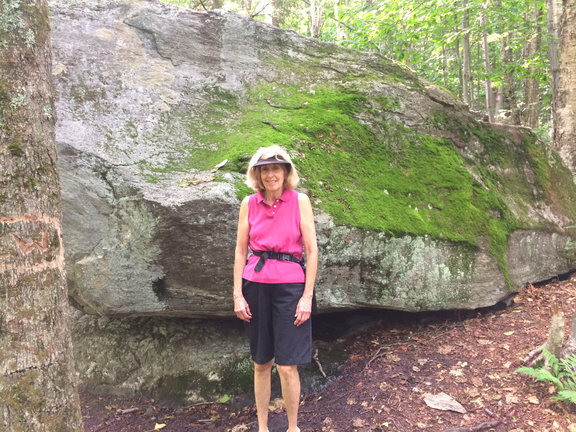 One of our more memorable hikes was a trek to Killington Peak with our friends Chuck and Jane. We tried to take an "Easy Route" which brought us up Great Eastern. All was going well until we ran into about a mile of excavation work putting in new snow making pipe. 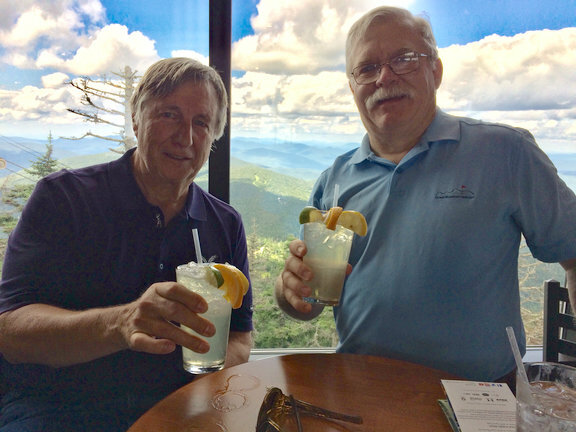 To celebrate our climb to Killington Peak, we stopped in to the Peak Lodge for some refreshments. But at the end of the day, our life revolves around the inn and our guests. We hope you have had a great summer as well. We are now busy preparing for the Fall Foliage and Winter seasons. Drop in and join us for a beverage the next time you are in Killington. And what ever you do, where it is still summer, don't forget your sun screen.